The founder of the school was John Pynsent. He was born in Chudleigh, married Mary Clifford and became a wealthy civil servant at Westminster. He never forgot his roots, for in 1666 he expressed his intent to erect a school in Chudleigh for the free education of the children of the parish. He negotiated with Lord Clifford and the leading parishioners of the time to acquire 'part of the sporting place adjacent to the church yard amounting to one acre'. The ground was walled off for a garden, orchard and playground. The school was duly built to accommodate twenty boys, together with the schoolmaster's house. This would appear to be the whole front of the house as it stands today with the school room to the left and the master's house to the right. The house continues today as a private residence, 'The Old House', and stands in Fore Street just to the south of the parish church. 'JOHN PYNSENT OF LINCOLNS INNE, ESQ, BOREN INT HIS PISH HATH ERECTED THIS FOR A FREE SCHOOLE & INDOWED IT WITH THIRTIE POVNDS PANNVM FOR EVER. 1668'. Above the tablet is his coat of arms, a chevron between three stars. Due to delays casued by the executors in administering his will, the house was not completed until the early 1680s and the charity not formally established until a decree in Chancery was issued in 1682. 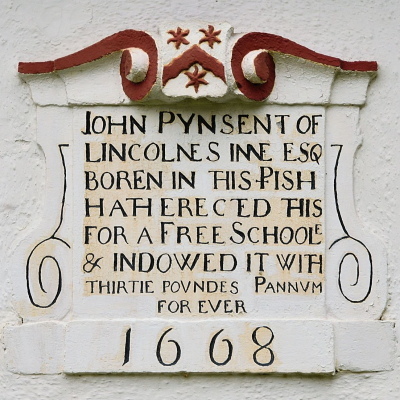 Pynsent's plans were for a free school for all the parishioners and inhabitants of Chudleigh for ever, without payment of any sum of money to the schoolmaster for the teaching of children. Furthermore, he expressed a wish that the School Trustees 'should appoint a schoolmaster of good name, manners and teaching and conformable to the doctrine and discipline of the Church of England'. Unfortunately John Pynsent died in 1668 at his estate in Croydon, Surrey before the school was completed and his wishes were never fully implemented. He was buried in St John the Baptist Church, Croydon and a large memorial erected. Unfortunately this was lost when a serious fire occurred in the 1930s. By his will Pynsent also left to five poor boys, yearly, £3 a piece for five years towards buying them books and clothes. There appears to have been no endowed funds for this particular endowment to continue. For the next one hundred years little is recorded. However each of the schoolmasters had taken Holy Orders. They were appointed for life and were paid £30 per annum for the teaching of the boys out of the endowment bequeathed by John Pynsent. The remainder of their income was drawn from the pupils fees. Out of the total income, the Master was responsible for the running costs of the school together with the repair of the buildings. In 1771 the Rev. Garrett was appointed and was paid £30 per annum. An advertisement for the school under his headship states that the curriculum included the classics, some English literature, arithmetic, French, drawing, and dancing. It stated that the maximum number of boys was twenty-five, and added 'the strictest Attention paid to their moral and religious principles'. The terms for Board and Schooling was twenty guineas per annum plus three guineas entrance fee. The advertisement also reflected the attitude of the time, 'Security and separation from the Town, and surrounded by proper Fences, within which the Boys are always confin'd', suggesting that it was an elite establishment, not quite what its founder would have wanted. By 1817 the school under the direction of the Rev. Pulling had diminished in size to six boys. The income would have been reduced proportionally and this could account for the condition of the property which was described as poor. When the Rev. Cuming took over in 1818, he had to expend a considerable amount of money to repair and extend the property. By October 1822 he was teaching ten Chudleigh boys together with twenty-five boarders. He built a spacious and lofty schoolroom and two-storey dormitory, also a classroom for a second master. The Rev. Cuming was obviously very efficient having built up the numbers and possibly came the nearest to implementing John Pynsent's wishes. However, two of the Trustees objected to the schoolmaster's determination to conform to Church of England doctrine. They complained that unlike several of his predecessors, Catholics and other non-conformists were denied the chance of a free education. These two were overruled. In 1843 the Rev. Collins took over a flourishing school and he added another classroom and a third master. He stayed for seven years and on retirement moved back to Cornwall. Rev. Collins was followed by another Cornishman, the Rev. Moyle. White's Devon Directory of 1850 states that the school was of high repute. The Rev. Moyle was held in high esteem and this view is substantiated by a commemorative plaque in the Church presented by two of his former pupils following his death at a young age in November 1861. He had retired in the early autumn that yeardue to ill health. An advertisement in the Chudleigh Weekly Express for a new head master followed Rev. Moyle's resignation. The successor was to be a clergyman with the election taking place on 18 December 1861 at the customary salary of £30. It stated that the school, of high reputation accommodated forty boarders, and for them was a large playground and commodious residence. A Charity Commissioners report in the early 1860s, shows that the boarders' fathers were professional people, merchants or those of independent means whereas fifty per cent of the fathers of day boys were either farmers or shopkeepers. Discipline is mentioned in the report and it seems that corporal punishment was rare, and the good conduct of the boarding houses was maintained by Prefects. The successor to Rev. Moyle was the Rev. Inman. He was also curate of Chudleigh Knighton parish. The 1864 Charity Commissioners Report suggests that the school was running well. The curriculum was expanding but the school was becoming costly to run. Boarders were coming from as far afield as Wolverhampton and Melton Mowbray. A later report of 1867 shows that numbers were falling with nineteen boys, eight of whom were boarders and the remainder day boys. One of these was a free pupil. At this time, boys from the elementary school known as the National School in Chudleigh went to Pynsent's to be 'finished'. But with rising costs and falling admissions, there were insufficient funds to run the school, and urgent repairs to the buildings were neglected. By 1872 the school had reached an all time low. It was inspected by the Charity Commissioners inspector and found to be inefficient. He recommended that the school should be abolished. A report made proposals for the school to be closed and the income applied for advancing the education to boys attending the public elementary schools in Chudleigh. The school closed and the last three Chudleigh boys were Ellis, (landowner's son), Lillies (G.P. 's son) and Doke. The school remained closed but the Master stayed in occupancy. He was served with a notice to quit in 1874 with the threat of legal proceedings. Apparently, it was believed that Inman had 'devoted himself to agricultural pursuits' and had thus neglected the duties and interests of the school. But the residents of Chudleigh, particularly the farmers, were keen that the school should be resurrected and in January 1875 the Trustees wrote to the Charity Commissioners requesting permission to repair the old school house, pull down the temporary extension built by the Rev. Cuming and appoint a new master. It was obvious that a revised financial scheme should be adopted by the Trustees to make the school viable. But even at this time the school was considered old fashioned and possibly outdated. Nevertheless, it was thought it could still operate successfully as a County School by the Trustees. In 1877 the Pynsent Exhibition Foundation was formed. It was to be regulated by a scheme made under the Endowed Schools Act. This created three scholarships for boys who had attended the National School for the amount of their tuition fees. In May 1877 there was a notice sent to old boys appealing for funds to raise money to repair the buildings. The money was forthcoming and the repairs went ahead. The school was re-opened following the repairs and the Rev. Crofton Green became the schoolmaster. He employed a second master, a Mr Mackay who taught languages and mathematics. It is said that he (Mackay) was loved by everyone. In 1889 Kelly's Directory stated that the three scholarships were in operation. By the early twentieth century, the curriculum had expanded again to include algebra and geometry. Boys came from France, Holland and Germany. A good education was still being offered. A local boy, Albert Victor Knight, born at Little Silver in Old Exeter Street, Chudleigh, attended the school in 1911. He became an Officer in the Merchant Navy and his annual report is on record; sadly he was lost at sea only 8 years later on 11 May 1919 aged 22 years. It would have been doubly sad for his parents Francis and Sarah, as they had previously lost their elder son Ernest Francis Knight on the Western Front on 1 July 1916. During the early part of the twentieth century many of the small endowed grammar schools were either closing or being incorporated into the state system. At the close of 1912 only five pupils remained and the decision was made to close the school on 31 July 1913. The scholarship boys were sent to Newton Abbot Secondary School and their fees and maintenance paid. The property was sold to Mr Mackay for £700. It was sold below the market value 'as some slight reward for all the years of his teaching life at a meagre salary'. The school became the home of the Mackay family thereafter. 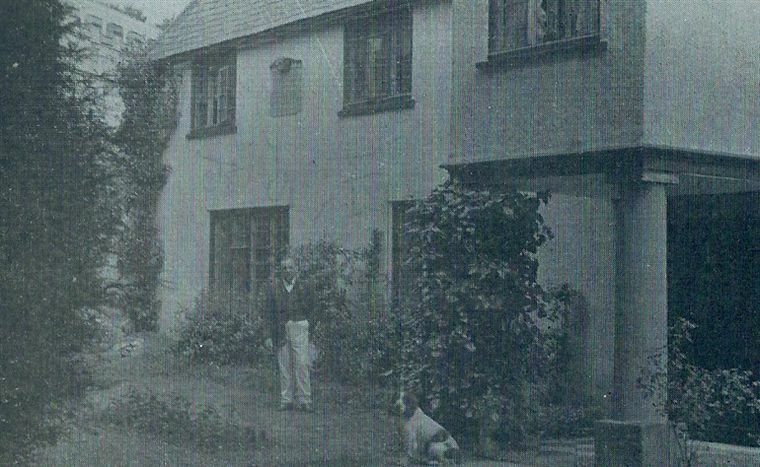 Mr Mackay died at a nursing home in Truro in 1919 and his widow remained at the house until about 1925. Following Mrs Mackays departure the building beacme known as 'The Old House', that name continuing today. Her successor was an ex-military man, Lt Col William M Acton DSO. He stayed for almost ten years to be replaced by another retired professional man, Dr Leslie A Drake MB CM. He stayed for no more than eight years and was followed by another retired military man, Major Fleetwood Hugo Pellew and his wife Violet (nee Du Pre). He died at the house in 1961, she three years later in 1964, they were both cremated at Torquay and have a small memorial on the south wall of the chancel in Chudleigh Church. The Pellew's were both very active in community affairs and for many years provided their lawn for the annual summer church fete after the vicarage had moved from Glebelands to part of Culver House. In some years Spanish donkeys were provided by the Farquhar family of Whiteway to provide rides for the schoolchildren on the fete days. On sale the house was then run as a successful guest house by Mrs Johnson-King for the next twenty years. To the rear was the detached coach house and the dormitories of Rev Cuming's time that had been converted to four self-contained flats. Additionally there was 1500 sq. ft. of workshops and the level walled gardens extended to one acre. In 1984 the house was next put up for sale. The main house has three principal reception rooms that include a 33ft. long sitting room and six bedrooms on the upper floor. A sale advertisement went on to say that because the building had been a school administered by a trust not given to expending money out of hand it had escaped the popular 'modernisation' projects carried out during Georgian and Victorian times. The only concessions to the 20th century were its gas central heating, modern wiring and plumbing. The Old House today still retains many of its old features and continues to be used as a bed and breakfast business run by Mrs Margaret Jeffs, with six bedrooms, double, family and single rooms, en suite. Fifteen guests can be accommodated in total. There is also an attached self-catering apartment for two persons. Much of the extensive lawns to the south were disposed of in the late 1970s and have been used for a housing development named Lawn Gardens. To the rear of the main house in what were the former dormitories are located four self-contained flats.